Customer Loyalty Made Simple With ePunched! There are a few important reasons to consider expanding your marketing to mobile this Summer. There’s really no time to wait. The majority of your customers already have smart phones, they use them more for apps then anything else and over 80% of consumers say they use mobile devices when considering a buying decision. They also prefer to receive incentives on their smart phones and are more likely to join an app-based loyalty program. So why should you consider an app for your business? It’s easier, for both you and your customers. Using an app means consumers never have to dig around for plastic cards or printed coupons. It’s also more convenient as it’s easier to download an app then to complete an application form (and also eliminates data entry errors). They also can see at a glance where they are in the program – i.e., “You are two punches away from saving $5”. A simple tap and they can see all the rewards they’ve earned or those they are eligible to receive. Make no mistake, your customer will download your app because the benefits are obvious; they check in, collect punches and redeem rewards. But what keeps them using your app? 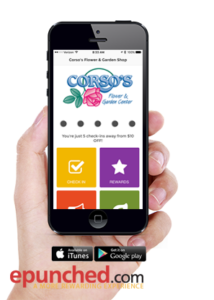 At Sunrise Marketing we’ve put our 20 plus years of garden center experience to use to create additional features you can add to your app. Ask Us – Users can take a photo from the app and send it along with a question or comment. This is a feature they will primarily use while they are NOT in your store creating an ongoing connection. You’ll become a valuable resource for ALL their gardening needs. Social Media – Users can connect immediately with all of your social media sites with a simple tap from one screen. This makes sharing easy and easy is good. Your Hours – One of the main questions your customers have is are your open. A single tap can reveal your hours, get directions, or even call your store. What’s new? What are the six new features? 1) We’ve expanded the flexibility of the screen to allow for smaller tiles which translates into two, three and now four column features. This means less scrolling and easy access. 2) New mulch calculator. We’ve developed a calculator widget that can be adapted for a variety of uses – mulch, soil, stone, even grass seed. We’ve made it easy for your customers to accurately determine their needs. 3) We’ve also partnered with NetPS Plant Finder. 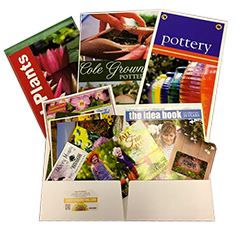 This is the gold standard for plant guides with over 18,000 plants that you can customize completely to your business. The mobile format makes it easy to use on smart phones and tablets. Users can also find a plant and then “add to list” all within the app. They can then access their ‘saved’ plant from the ‘my plants’ tile. They can also share results with friends. We can easily incorporate the NetPS Plant Finder into your app and website. 4) Store mapping feature. We’ve added the Mapify Pro mapping feature as an option on your mobile app. Using GPS it allows you to drop ‘push pins’ onto a Google Map of your business. These push pins can be augmented to add descriptions, photos and even short video clips. Navigating your garden center can be a challenge. We’ve made it easy with Mapify Pro. 5) Enhance Your Experience. One of our existing app customers came up with a clever way to encourage their customers to ‘open the app now’. Color coded signs offer video instructions, instant incentives or links to any URL based content. We’ve also created an additional sign – ‘open the app and use our plant finder tool’ – all triggered with a pre-programmed ‘beacon’. 6) You can now edit your tiles – add them, move them, replace them all from the epunched management console. There is no end to the options for keeping your app easy to use with fresh new features and graphics. Make this Summer the time for you to integrate this easy to use technology into your business. Everything described requires ZERO effort from your staff. We’ve taken the notion of a ‘silent’ salesperson to a new level with beacons that can transform your displays into an interactive experience. Contact Sunrise Marketing directly at support@sunrisemarketing.com or call us 888-393-4443.